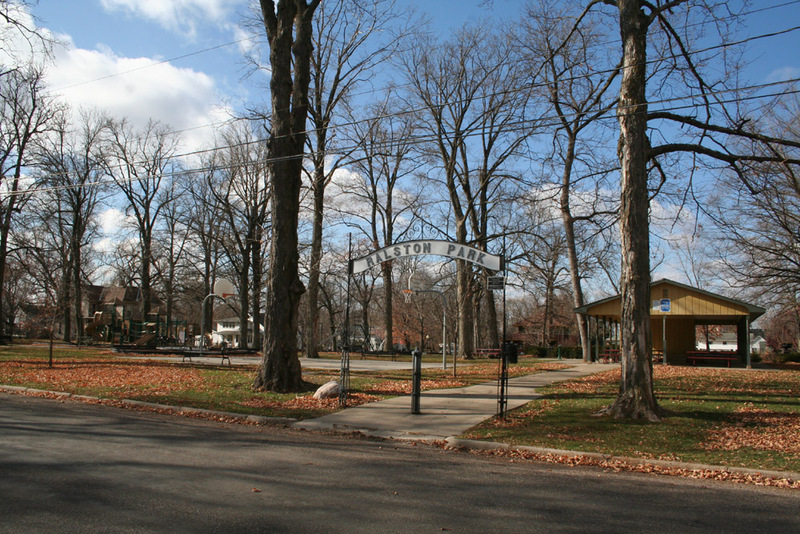 Ralston Park was started in 1844 by an appropriation of $100 by the Warsaw City Council and a donation of $200 from citizens to purchase a square in Ralston Addition. It was the site of many celebrations and band concerts. This square was believed to have been the parade ground for troops stationed at Ft. Edwards. This park was built twenty years after the closing of the Fort. On June 12, 1897, four wrought iron arches for the Ralston Park entrances and a larger arch for a carriage entrance, a gift from two successful Warsaw brothers, Oscar Scherer and Albert O. Scherer of New York, arrived in Warsaw and were installed. They were light, attractive and were in keeping with the surroundings. The arches were designed by the E. T. Barnum Iron Works of Detroit, Michigan, a company that specialized in decorative iron work. There were four arches for the entrances for pedestrians and one, bearing the name “Ralston Park” across the archway, which spans the carriage entrance. Oscar Scherer was born in Warsaw in 1856 and in 1871 had the opportunity to visit New York City. Finding the city to his liking, Scherer decided to stay on and found employment with Charles Hauselt, who at that time was one of the country’s largest leather companies. In 1890, after 19 years with the company, Scherer and a nephew of the company owner formed a partnership and took control of the company. This partnership continued until 1893 at which time Scherer’s brother, Albert, came into the firm and the name was changed to Oscar Scherer and Bro. Incorporated. The Scherer brothers were pioneers in the coloring of shoe leather and introduced chrome-tanned coloring, which changed the leather shoe industry. Although Oscar and Albert Scherer left Warsaw at an early age, their sister, Adele, married Henry Buschling and remained here until her death in 1926. Many will recall the Buschling sisters who occupied the residence at 810 Crawford, which more recently became the home of Tom and Sandy Bertucci. After many years of being absent, the four comer arches were restored by Park Board President, John Bavery, and longtime resident, Pat Thompson. The Warsaw Park District financed the undertaking and both Bavery and Thompson had spent countless hours reworking the metal structures. The rebuilt arches were installed in July of2005. The carriage entrance has remained in the same spot since 1897. New park benches and receptacles were also installed in 2005, adding a Victorian touch to Ralston Park. In 1950, a miniature Statue of Liberty was erected in the center of Ralston Park as Warsaw pays homage to Liberty. Warsaw’s Statue of Liberty is an eight and one-half foot brass and bronze replica and was presented to the City of Warsaw as a gift by Frank H. Conner of Chicago, a native son who grew to manhood in Warsaw. Mr. Conner, brother of Mrs. J.B. Worthen, purchased one of the first fifty miniature statues created by Jack Whittaker of Kansas City, Missouri. The statue is one-nineteenth the size of the original statue. In 1974, the Park District built a shelter house. Ralston Park has many amenities including water, electric, restrooms, a basketball court and a modem children’s playground area. The park contains beautifully landscaped gardens that are maintained by local volunteers led by Rita Kerr. Ralston Park has been the site of the annual Septemberfest celebration, which previously was called Hay Days in honor of John Hay, a well-known historical figure who served as a private secretary to President Abraham Lincoln. 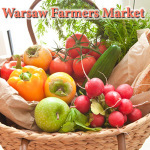 A farmers market currently takes place every Thursday evening in the park from mid-May through October, selling local produce and handmade crafts. Ralston Park is located at 430 North 4th Streeet, or 40.362954, -91.435510.